Need more information about booking Home 9621881 ? Have you ever wished to get away from noisy andbnotoriously monotonous city life and find some peace and quiet? What if you find a place that encapsulates all that you’ve hoped for and more, not too far away from home? 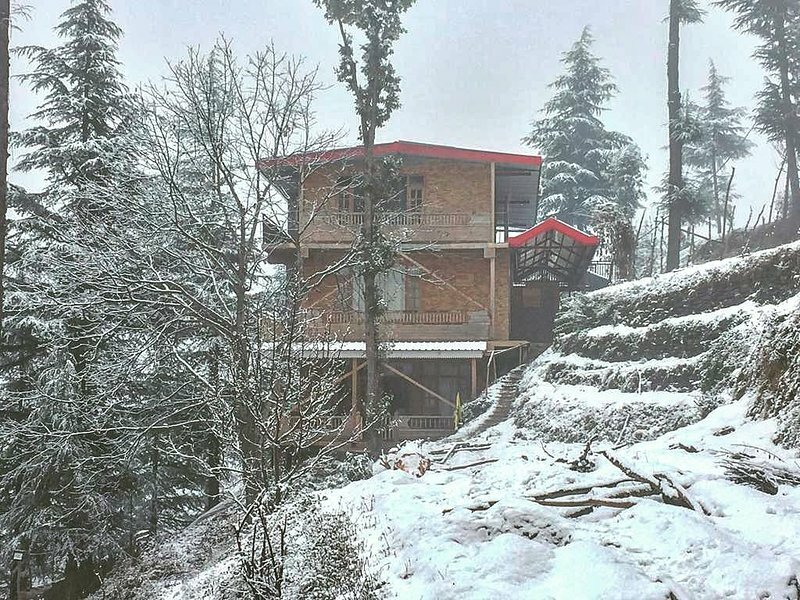 Nestled in the bountiful greenery of the tall peaks and amidst the evergreen and majestic Deodar (cedar) trees come live a little at Royal Swiss Cottage in Chail (Himachal Pradesh). THE PLACE YOU CAN CALL HOME! Just hit the road and head over to our beautiful Cottage homestay which is located 5 kms east of Chail. While on your way, you’ll become one with nature as you make your way to our cottage. And guess what? It takes not more than 20 minutes for you to get here and cuddle the sweet whisper of the evening sky. We know how to make you feel at home. So, you will find each room in our cosy cottage well-equipped with luxuries and daily necessities from your morning cup of tea or coffee to preparing a hearty breakfast for you. If you want to prepare a lovely meal for your spouse or for your family, you have a whole kitchen to yourself where you can go wild. You can of course take a look at all the amenities on-the-house right below or just give us a call, anytime! Hate to part from your car? Don’t worry; it will be tucked away safely in our private parking. You will find the peace and quiet that you’ve been longing for at the Royal Swiss cottage. Away from the blaring horns, you will be able to hear the crackling of the bonfire while you cosy up outside your cottage room and indulge in a beautiful evening of soft music, cheerfulness and warmth. If you love interacting with the locals, we will accompany you to a cute, little village down in the valley. Unwind in the beautiful countryside, wake up to the rising sun behind the clouds, de-stress and let the silence of the mountains fill your mind with good thoughts. Nearest airport - Chandigarh International Airport (110km) Nearest railway station- kalka railway station (70km) Pick up and drop off services available via cabs of all types (sedan , mini , SUV) Local treks at walkable distances. The owners stay at the property and the staff will be available for assistance to the guests. The room keys will be handed over to the concerned guest and any form of information can be provided by the staff as well as the owners. We encourage barbeque and bonfire events. Plus we have a travel desk that'll facilitate picnics, treks, biking trips and many more adventure activities. You can get in touch with Aditya (the owner) through the contact form on this page. Send Aditya (the owner) an email through the contact form on this page. Alternatively, if there’s a phone number on this page, you can call them. How do I contact Aditya (the owner)? If you’ve already booked, go to Manage your holiday booking to view Aditya the owner's contact details or send them a message. Or send Aditya (the owner) an enquiry through the Contact the owner/manager form if you’d like a quote or more info first. When you pay online through the Book your stay form, a booking request is sent to Aditya (the owner). You’ll find out within 24 hours whether they’ve accepted - no money will leave your account before then. You can also request a quote from Aditya (the owner) through the contact form. The owner will email you the total cost for your dates and a link to book and pay online. Use the Book your stay form to pay provisionally online. You can pay by credit/debit card or PayPal. Aditya (the owner) will have 24 hours to accept the booking and no money will leave your account before then. Why can't I call Aditya (the owner) before booking? You’ll need to contact Aditya (the owner) to do this. Send them a message in Manage your holiday booking or through the contact form on this page. You can request to change the dates or number of people on your booking via the Manage your holiday booking page. To change your holiday dates use the Edit booking button. If you need to change the number of guests staying then send Aditya (the owner) a message. If Aditya (the owner) agrees, they’ll send you a revised quote outlining the changes. You can review and accept/decline this from the Manage your holiday booking page. You’ll have 48 hours to take action before the revised quote expires. Estimated price per night based on a weekly stay. Owner fees of £2.00 per stay may apply. Enter your dates to see the total cost.